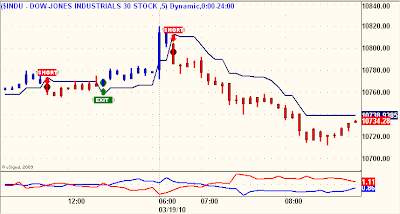 Below is the 5 minute view of the DJIA. Noteworthy is the Trend SELL signal, the impulsive nature of the decline (compare with previous decline on left side of chart) and the ABC correction over the past few bars. If the low is taken out impulsively later on today, I expect longer-term Sell Signals on my longer-term models. Subscribers should be watching their Key Reversal Levels. "Reaching reversal points" is not the equivalent of triggering reversal points. Wait for the bar you are following, i.e. 60, 240, Daily, Weekly, to close and then take appropriate action (or inaction).